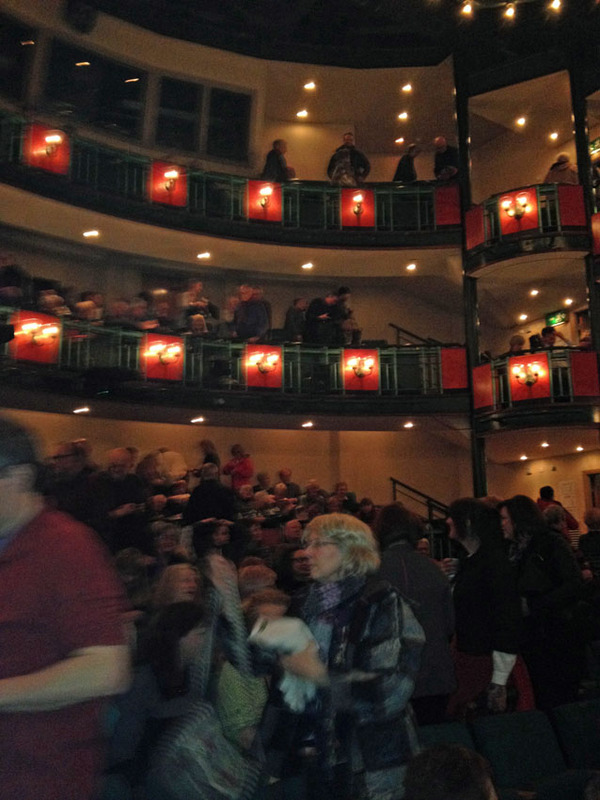 The theatre was packed – there were a few rather bemused men in the audience but they were vastly outnumbered by excited WI women. It was a cracking night out. The play was genuinely fantastic and you wouldn’t need to be WI to enjoy it. They absolutely nailed the often contradictory nature of the WI and it was at turns moving, funny and inspiring. 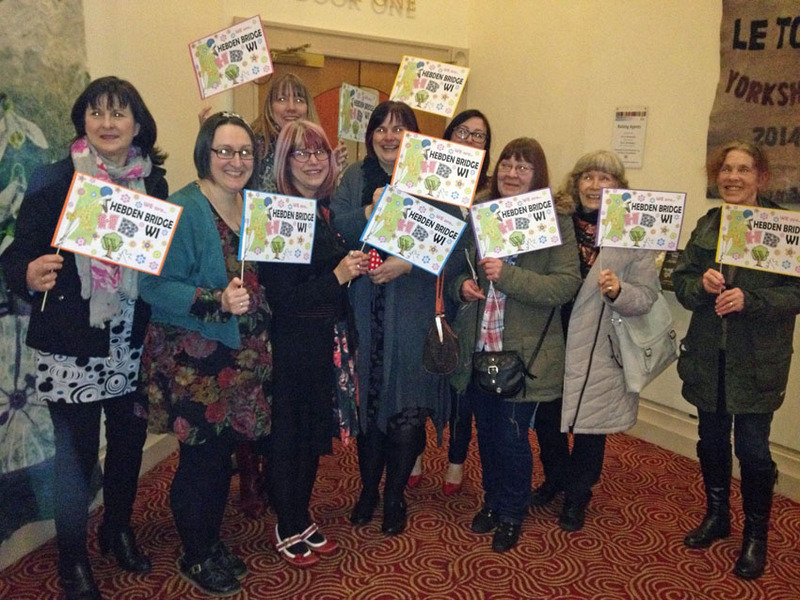 We even got to sing Jerusalem (something we don’t do at our WI, so it was a novel experience for us). It was hard to believe that the talented cast of only 4 actors (2 of them men!) were able to switch effortlessly and convincingly between so many different characters and sing and play instruments. We were very impressed. And of course, being the WI, there was also cake. Our fabulous Huddersfield neighbours, Tea & Tarts, had organised a ‘cocktail cake’ competition and there were loads of tasty entries, which we were happy to indulge in. Alas, our president’s iPhone wasn’t up to the low lighting and seems to have turned us all into glowing-eyed zombies. But at least we’re cheerful zombies. 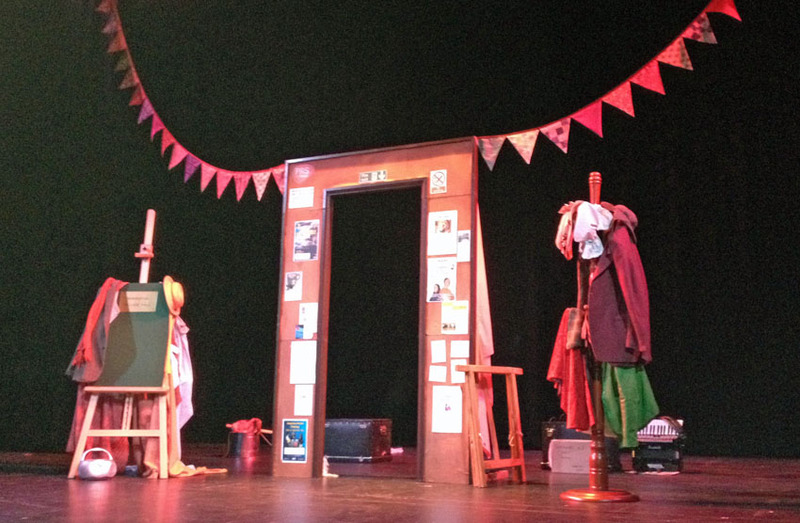 Mikron tour the country by narrowboat: if they’re coming to a venue near you, we hugely recommend going to see this excellent play. And if the history of the WI isn’t your cup of tea, they’re also doing a play about fish and chips. Our president, Kirsty Hall also took this opportunity to pass on some handmade daisies to Joanne Croxford from Cambridge Blue Belles, who was at the opening night because she’s the glamorous model for the Raising Agents poster. 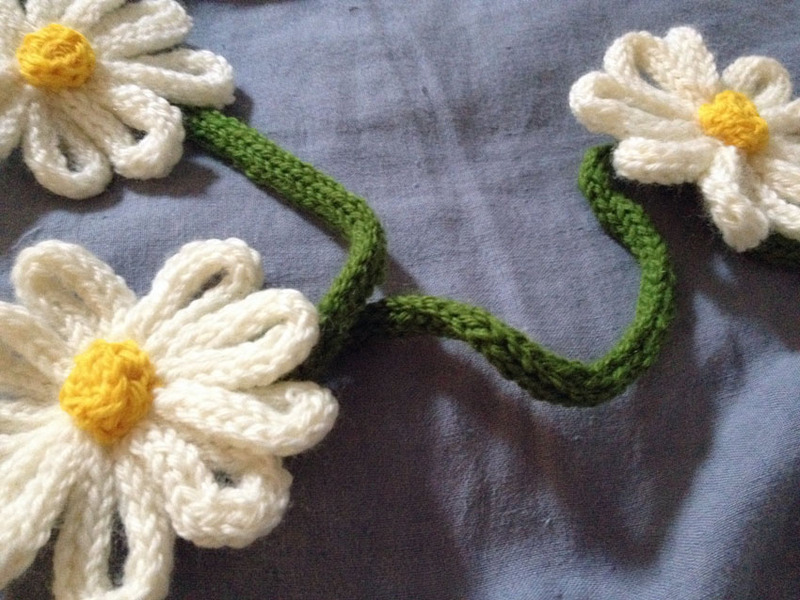 The daisies are for Daisy Change WI in Cambridgeshire, which Joanne founded. Daisy Change is the first WI to be set up in a mental health facility. Unlike previous hospital WI’s, it is open to both patients and staff as well as women from the wider community. Patients are finding it truly life-changing to be able to step out of the role of ‘mental health patient’ and be a fully equal WI member and it doing a lot to break down stereotypes around mental illness. To welcome this innovative WI to our fold, WI’s across the country were asked to make daisies to brighten up the hospital with a spot of yarn-bombing. So Kirsty made some knitted daisies (she finished them in the car on the way over! 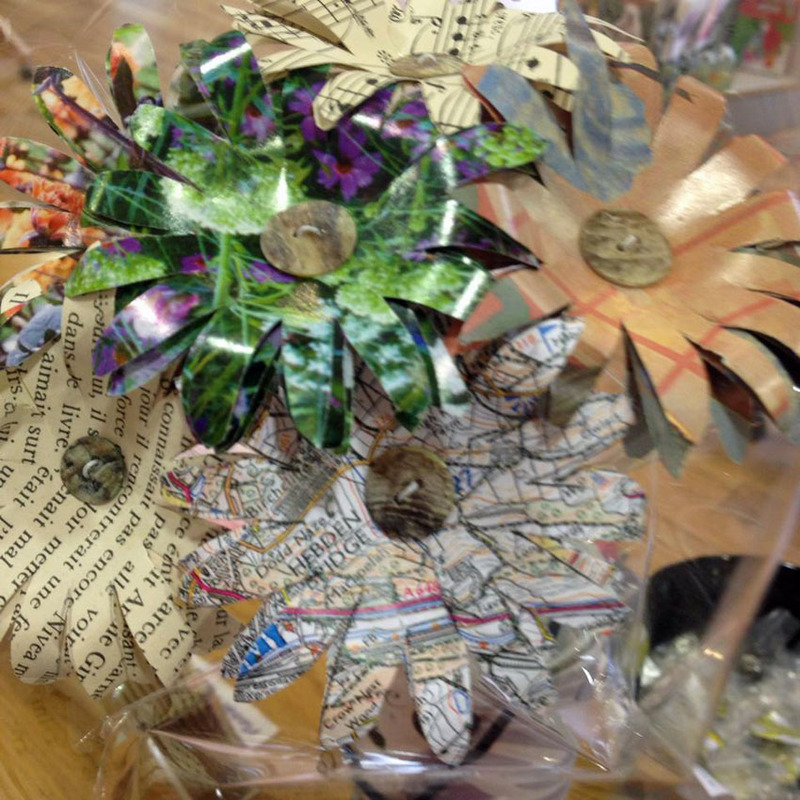 ), while our talented paper artist, Sue Leslie contributed some beautiful, hand-folded, paper ones. Joanne was thrilled to bits when Kirsty handed them over. We hope our Daisy Change sisters were equally delighted. 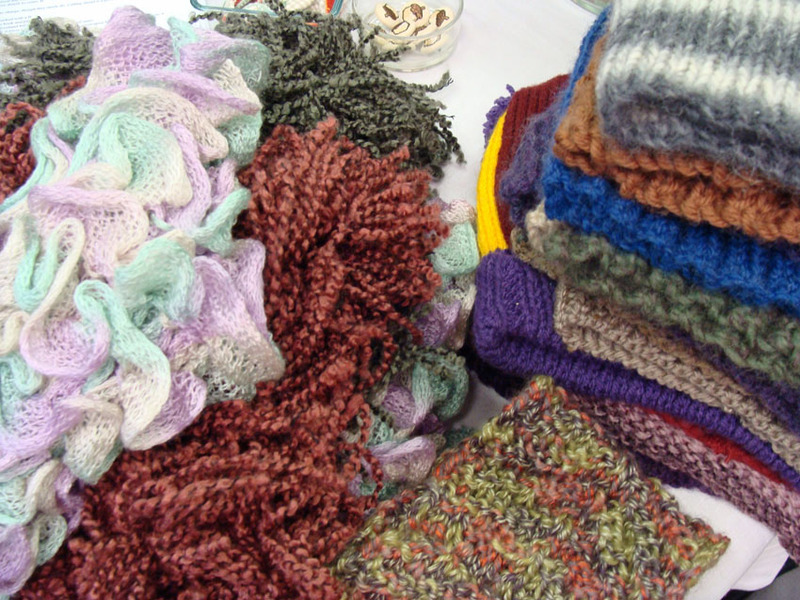 Further knitting took place for our current charity of the year, SmartMove. As well as raising money, we realised we could do something practical to help their clients. 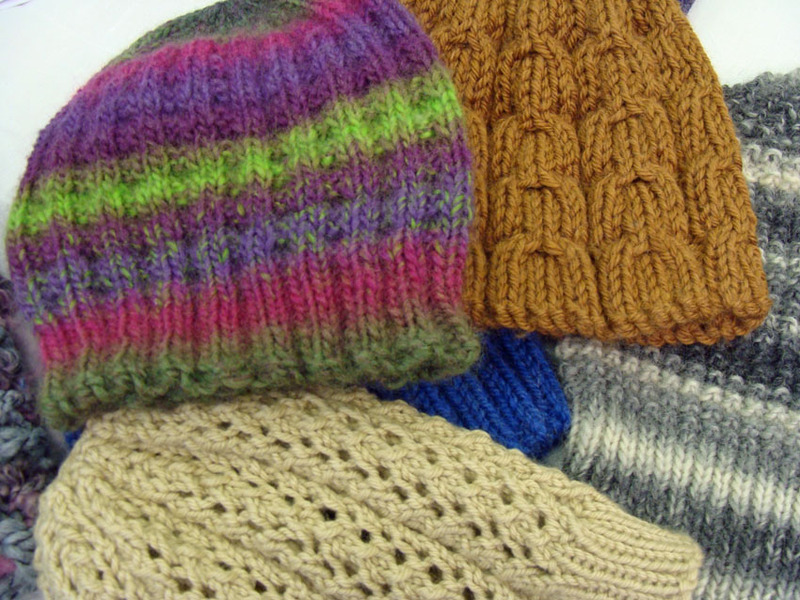 So we put out a call for knitters and crocheters and our members responded by making 13 hats, 2 headbands and 3 scarves. Our President, Kirsty met up with Craig George, the fundraising manager for SmartMove in the appropriately yarny setting of Ribbon Circus to do an official handover of our woolly goodies. The hats, scarves and headbands were gratefully received by SmartMove’s clients and were distributed straight away. Obviously money is the most important thing we can give to our charity of the year – most charities would rather get money because it’s more useful than goods, so that’s always our focus – but it was lovely to donate something a bit more personal too.